Is Pure Genius saying goodbye for good? CBS has released a synopsis for the season one finale of the TV show. The medical drama follows top doctors as they team up with cutting-edge tech experts and try to push the boundaries of modern medicine to save lives. The cast includes Dermot Mulroney, Augustus Prew, Odette Annable, Reshma Shetty, Aaron Jennings, Ward Horton, and Brenda Song. CBS has not yet announced whether or not Pure Genius will return for a second season. However, things aren’t looking great. So far, season one is averaging an 18-49 demo rating of .87 and 5.37 million viewers, placing it third-to-last out of CBS’ scripted TV shows for the 2016-2017 season. The season (and possibly series) finale of Pure Genius airs on January 26th at 10 p.m. ET/PT. “Lift Me Up” – Angie tries to target her mother’s illness using radical nanobot technology, but she looks to Scott for help when her mother prefers using traditional methods. Also, when a graffiti artist with a clotting disorder falls from a bridge, Walter, Malik and Zoe attempt to use suspended animation to stop his internal bleeding. 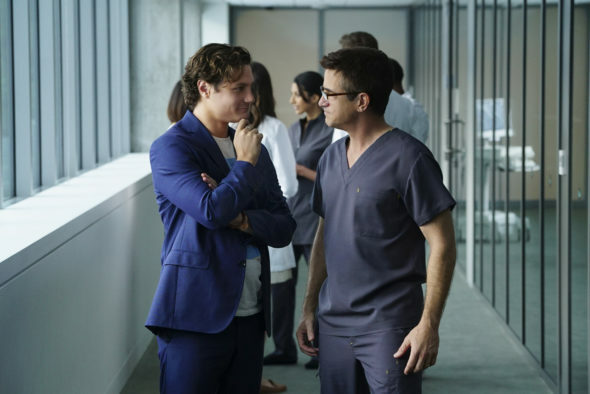 And Walter is put in an awkward position when Julianna discovers James used the unapproved GSS drug on Louis Keating, on the season finale of PURE GENIUS, Thursday, Jan. 26 (10:00-11:00 PM, ET/PT) on the CBS Television Network. What do you think? Are you watching Pure Genius? Do you think it should be renewed? More about: CBS TV shows: canceled or renewed?, Pure Genius, Pure Genius: canceled or renewed? Pure Genius: Is the CBS TV Show Cancelled or Renewed for Season Two? Pure Genius: Cancel or Renew for Season Two? We love this show. Bring it back!!! Wonderful cast and story lines. For those that have blasted the medical side of it; think outside of the box. That’s how numerous things have been invented. Big mistake to not renew it. Love the lead character, perfect for the show. Love the concept, brings new medical ideas to the forefront to save people – even if I’m not sure those medical inventions can work…gives people ideas. Good scripts, good cast, it’s just getting going as the characters settle in. GREAT non violent SHOW. PLEASE KEEP IT. We really love this show and will be SO disappointed if CBS cancels it!! It is well written and well acted and pertinent to the technological medical advances that are currently or soon to be in our arsenal of health care. PLEASE give us the opportunity to continue to watch a quality series. I love this show, wish they’d renew it. I am sorry I don’t fit in your catorgory of 19 to 49 crowd, but I love, love this show I am 62 and appreciate the science behind this (real or not) intergrated with the people who do care and their separate plots. Please give it at least a second chance. I am 54 and my daughter is 19 and we love the show. However I think changing the name to Bunker Hill or Bunker Hill Hospital might work better. People channel surfing may draw the conclusion that it is a science show just by it’s name and keep clicking past it. That’s what I did. Please, please do a a second season of pure genius! It’s refreshing to have a show like this on the air that leaves you feeling good after watching. It’s a nice change from a lot of other stuff that’s out there. My mom and I love it! Pure Genius should be renewed for another season and more. It truly is one of just a handful of shows I enjoy watching. TV land is a wasteland. When an oasis of a show comes along like Pure Genius it is so refreshing. My husband and I love this show!!! Please renew for another season!!! I really like this show! I have watched it from the beginning. Great Show!! Please do not cancel this show. I love this show never miss even watch repeats on demand till the next weeks episode plays please please please dont cancel it.i love all the characters and the story lines are great. My husband and I love this show. It offers hope and something besides the ordinary. Please please renew this show. Love Pure Genius. Very inspirational. Likeable characters. Great feel good show.